Grafting cucumber with squash rootstock (Cucurbita maxima, C. Moschata and C. maxima X C. moschata) has proven to be an effective approach to improving cucumber's cold tolerance. Vegetable growers are likely to benefit from this technique for extended early season cucumber production under protected cultural systems. Grafted cucumber plants are not readily available in the market now. However, it is possible for growers who are interested in this technique to graft cucumbers on their own. Three methods are commonly used to graft cucumbers: splice, hole insertion and tongue approach grafting techniques. Compared to the hole insertion and tongue approach grafting methods, splice grafting is simpler, and therefore it is more likely to be adopted by beginning grafters. 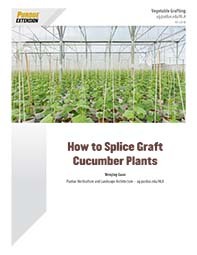 This publication introduces a systematic guide on how to splice graft cucumber plants.